This piece is part of a cycle of pieces, all of them entitled “Arabesque”, in which I have tried to exploit the different possibilities concerning the hearing analysis capacity . 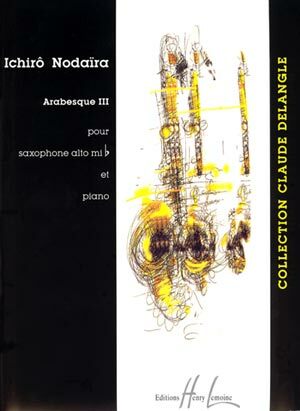 Arabesque III exploits, here, multiphonics and other possibilities of the saxophone, as well as the unequal resonance obtained by the use of the third pedal of the piano. The structure of the work has been developed from research in two directions, nevertheless convergent. a simple structure created from very complex elements, that cannot be analysed by ear. a difficult complex structure that can be analysed by ear created from simple elements. I really insist on the acoustic union of both instruments to give the impression of a unique sound body, because I wanted to use, for the saxophone and for the piano, the greatest possible scale of values between normal sound and noise (example: noises of keys and air for the saxophone, muffled sound for the piano). 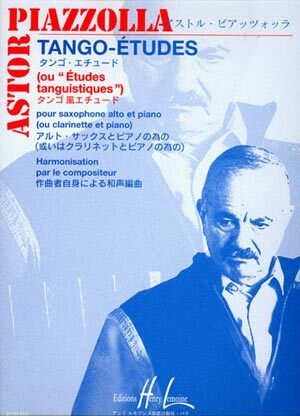 Some time after he gave us the manuscript of “Tango-Etudes” or “Etudes tanguistiques”, in the version for E b alto saxophone done in collaboration with Claude Delangle, in 1988, we asked Astor Piazzolla if he could harmonize them, taking into consideration the request of flutists after the original edition published for their instrument in 1987. In February 1989, the composer wrote to us from Punta del Este ( Uruguay ) where he lived temporarily before going back to Buenos Aires : “Dear friend, finished the piano part of the Etudes tanguistiques for saxo alto and piano… Good luck to Mr Delangle and please tell him to forgive my music handwriting. I was in a hurry and could not do it bet­ter… Please let me know if you received the music”. We indeed received the manuscript some days later… and we carefully put it away! The comprehension was so difficult* that this edition would have been seriously delayed. Therefore we published in December 1989, as it was first planned, the version for solo alto saxophone, postponing the harmonized edition until later. The Argentinean master had then serious health problems, until his death in 1992. The edition planned was published much later, after a hard and meticulous work on the manuscript*. * Concerning this matter, see the preface by Yann Ollivo.